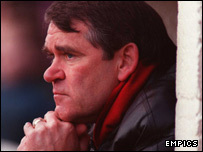 Former Yeovil manager Dave Webb has returned to Huish Park to become majority shareholder and chief executive of the League One club. He has bought out Jon Goddard-Watts although John Fry will remain as chairman, reports BBC Radio Bristol. Webb first went to Huish Park in 2000 and helped transform the Glovers into a full-time outfit. He left that September with Yeovil top of the Conference, but they were pipped to promotion by Rushden & Diamonds. Webb had four separate spells as manager of Southend - most recently as caretaker boss in November 2003. He has also managed Bournemouth, Torquay, Chelsea and Brentford.